Northport N.Y. – It’s great when we get our music on TV shows but it’s even better when the artist is on the actual show! 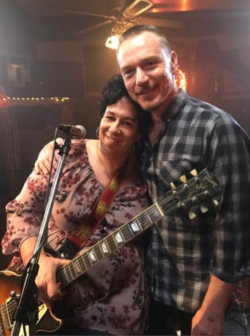 The Queen of Blues/Rock Guitar, Joanna Connor will perform a song for the Fox drama “The Exorcist.” The date of broadcast is Friday November 18th, 9PM Eastern. Click the photo of Joanna Connor and one of the stars of the show Ben Daniels for more. With her dazzling skills on full display ‘Six String Stories’ should win her an even wider audience. ‘Six String Stories’ is her first studio album in 14 years, but thousands of gigs in the interim have only enriched Chicago-based Joanna Connor’s fierce guitar skills and expressive, bluesy vocals. She’s one powerhouse of a slide blues guitarist, someone who attacks frets with a beautiful fury and doesn’t let go. Joanna Connor just put out her first release in 14 years and, wow, it’s a keeper.